We flew out bright and early Saturday morning (the 11th) on US Airways. It had its ups and downs. We were fairly rushed getting to the gate because of how slow the woman was checking our baggage (and being unwilling to help with my extra $5 charge I shouldn't have gotten, but that's another story). We had a layover in Phoenix that was decent... we had a bacon-egg-cheese quesadilla and then bought some Pizza Hut for the plane ride. There were a lot of storms in the midwest, so our plane didn't land in PHL until almost 7pm. We rented a car (another Impala), and headed on our way. I took a few photos as we took I-95 past Philly and to Newtown. We had a fabulous hotel the first night, but it was booked during the week so we needed to move. 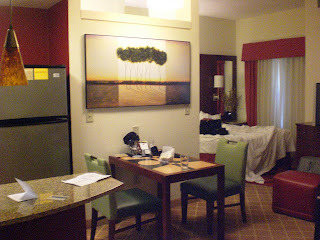 The first place was like a studio apartment, and I would have loved to stay there a few more days! 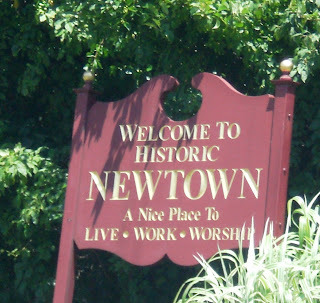 Sunday we drove through Newtown (not a big place), and to Richboro for lunch. We had some great grub at FreshWorks. We shared a "full" (2 FEET long!!) Bronco Chicken Cheesesteak (with bacon, provolone, and bbq sauce) and some of the best cheese fries I've ever had. They were lightly fried crinkle fries, and the cheese was like a spicy mild cheddar. The new hotel was pretty standard, but offered a full breakfast in the mornings, which was nice (the first hotel allegedly did too, but we were too jet-lagged to make it to breakfast). 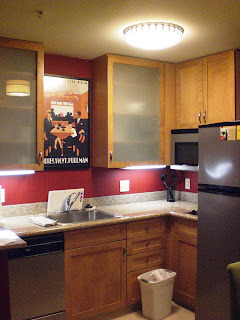 It also had a business center that allowed me to print out my travel documents and maps. Plus there was a laundry facility which helped our living-out-of-suitcases situation. We had subs from McCaffrey's for dinner on Monday night. I had salami and provolone, Jonathan had an Italian. Both were great, think Publix-style! Monday night we went into town and had Isaac Newton's. I had a Caesar salad and ribs combo, Jonathan had the London Broil sandwich, and we shared an order of Mozzarella Sticks. The complimentary bread was boring and cold, served without butter or anything. The appetizer was delicious, in the top 5 mozzarella sticks I've had, I think. My entree was very large, and very good. The salad was pretty standard for a Caesar, but was heavy on the dressing and light on the anchovy, which is fine with me! The ribs pulled right off the bone, but the sauce was a Tennessee Whiskey-flavor, which isn't a favorite of mine. Jonathan enjoyed his sandwich as well. It was served with chips and coleslaw, and was a little overpriced. Tuesday afternoon we toured four apartment complexes, one of which we liked more than the others. We're going to see what happens... picking a place isn't as simple as taking the one given to you (like we did in Cali).